For when you need heating where a traditional plumbed system is not possible then an electric towel radiator is the way to go. It also means towels can be stored and dried during the summer months. 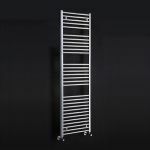 Electric towel warmers for bathrooms simply require connection to your electrical circuit by a qualified electrician then away you go. 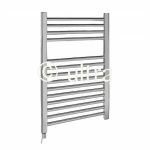 Models are available in powder white, chrome and in a high quality stainless steel finish. With sizes ranging from just 350 to 600mm wide and from 350 to 1800mm in height. All our products are ready filled with a built in heating element. These mostly have a simple on / off function but for use in a family environment consider electric towel radiators with thermostat built in for fine temperature control.